Part 5 of MindShift’s Guide to Games and Learning. 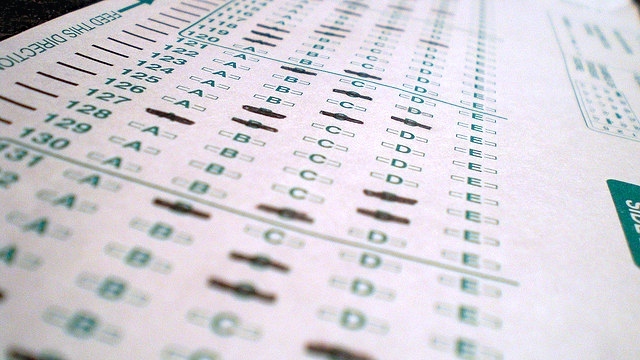 Nobody likes high-stakes testing. The problems are well documented. But maybe games can help to change the way we approach assessment. At least since John Dewey, educational theorists and scholars have been clear about the inherent shortcomings of thinking about education in terms of standardized, quantifiable outcomes. In order for instructional strategies to be successful at a large scale, they need to take individual differences under consideration. Not all students are the same. They don’t learn in the same ways and it's a fantasy to believe we can accurately assess them all using identical rubrics. Likewise, a great many of our widely accepted developmental theories are only accurate in a vacuum; they fail to take all the subjective cultural, ethnic, and socio-economic factors into account. Howard Gardner, John H. and Elisabeth A. Hobbs Professor in Cognition and Education at the Harvard Graduate School of Education, is best known for his theory of "multiple intelligences." “Human beings have very different kinds of intellectual strengths and these strengths are very, very important in how kids learn and how people represent things in their minds, and then how people use them in order to show what it is that they've understood,” he says. Even if you disagree with his theory about different learning styles, it's hard to disagree with the notion that making learning personal to students is beneficial. But as teachers know, bringing that personalized level of attention and assessment in a classroom of 20 or 30 students is a challenge: identifying individualized learning objectives on a daily basis, imagining measurements of incremental achievement, monitoring for mastery, and undertaking ongoing formative and substantive assessments. Consider the compounded complexity for the hundreds or thousands of students in a single school. Tens of thousands in a district. Hundreds of thousands in each state. Millions in the United States of America and globally. Games allow processes to take place all at once--instruction and assessment simultaneously happening through practice reimagined as play. Adaptive and game-based learning technologies aim to untangle the complexity that makes widespread personalized instruction and assessment seem unfathomable. Behind the shiny graphics and mechanics, many games and apps feature complex assessment algorithms that collect and analyze student data. Sometimes that data is simply there for the teacher to view (and also for the student in the best implementations). Other times, the software is collecting data about the learner and adapting accordingly. On the simplest level, adapting might mean changing the order in which the student is presented with challenges. But it can get way more complex, even factoring in metacognitive data and analyzing the confidence with which a student solves a problem or completes a level. Adaptive games and apps isolate skills and iterate contextualized instructional sequences, creating precise curricula tailored to the needs, strengths, and challenges of the individual learner. In addition, by cross referencing the data of all students using the system, these technologies can also continually monitor overall effectiveness in a comparative way. In order to understand how this works, you’ll need to step out of the ordinary way of thinking about education. We tend to break the school experience into three parts: instruction, practice, and assessment. The teacher delivers content to the student. The student does homework. We test for retention. Games allow these three processes to take place all at once--instruction and assessment simultaneously happening through practice reimagined as play. The promise of game-based learning is not only about increased student engagement and intrinsic motivation, but also about changing the way we think about assessment so that it is no longer in a category by itself. Using games, we eliminate the negative consequences of summative assessments and replace them with engaging formative assessments. Games provide the ability to evaluate students continuously in order to understand how to improve our teaching throughout the year. All good teachers do this regularly, but they can only do this for a few of their students some of the time. It just wouldn’t be feasible to do it for everyone all the time. Humans are fallible and subjective. We just can’t match the speed and comprehensive efficiency of a computer. However, in the not-too-distant future, and in a few schools even now, a teacher could tap an icon on a tablet every morning and receive precise assessment data about all the students in the class -- data that can be organized and optimized in whatever way is preferable, information that can help teachers design more impactful human-to-human lesson plans. McCool is describing a model where assessment is so fully integrated into a contextualized everyday learning experience that familiar questions about accountability are rendered irrelevant. We may not even talk about assessment anymore. Instead, we’ll simply be able to leverage the data that comes out of ongoing gameplay. Games don’t replace tests; they make tests unnecessary. The Institute of Play’s GlassLab is working on that very objective (Glass is an abbreviation for "games and learning assessments"). Their mission is to make continuous, research driven game-based assessments available for all standards. The unique thing about using gameplay data for assessment purposes is that it enables teachers to assess the choices that learners make rather than content they can regurgitate. Process is prioritized over the rote learning. The game monitors the decisions that learners make, evaluating students’ incremental progress. In other words, games assess how kids are learning rather than what they are learning. Some people worry that the very notion of using games as assessments is problematic. Most of this criticism is more about the problem with summative assessment than it is with using games themselves. James Paul Gee, a longtime proponent and researcher of games who has written many books on the subject, doesn’t want to see us replace the current “toxic mess” of standardized tests with games. Like Muzzy Lane and GlassLab, Gee understands that, “in a game, assessment and learning are completely integrated. It is hard to tell them apart.” The key point is that good game-based learning should use data that comes from continuous gameplay for the purpose of ongoing formative assessment, not just replace tests with games in a way that barely addresses the current student experience. Not only will game-based assessment translate into a better student experience, but also the data that games and adaptive learning systems provide will enable researchers to understand, with increasing precision, how students learn best. The promise is certainly exciting. But there’s also a scary side. If you're creeped out by the targeted advertising that shows up in your Facebook timeline, or beside your Google search results, imagine what the world would look like if advertisers had been tracking your decision making processes since grade-school. Our concerns about the NSA are nothing compared to the big brother surveillance state that we could inadvertently let into our classrooms. Be cautious, but don’t be alarmed. Some of the fear around big data is just a fear of the unknown. In many ways, the world is changing more quickly than we can comprehend. We cannot slow it down, but we can take the ride mindfully. Most importantly, we can use the new game-based technologies to educate a generation of citizens with more playful personalization than has ever been possible. Game-based learning has the potential to address many of the shortcomings and challenges that our current high-stakes testing environment presents.